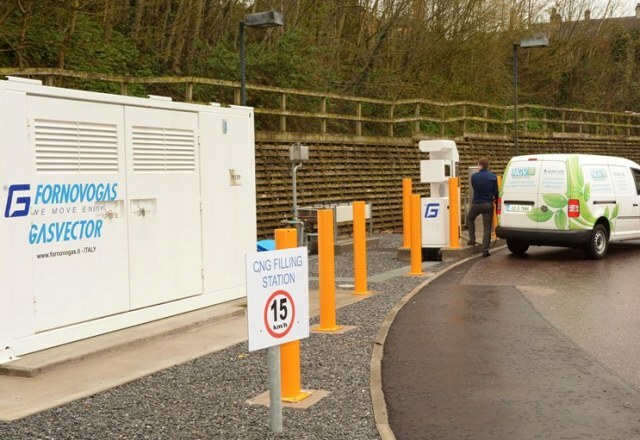 Earlier this month we announced that the European Commission had awarded €6.4 million in funding to help Gas Networks Ireland, the operator of the Irish gas network, develop the first 14 sites of a planned network of 70 public CNG stations around the country by 2020. Currently there are some privately operated fast-fill stations in Cork and Dublin, which feature FORNOVO GAS equipment. The facility in the picture was commissioned in January 2014 and is equipped with a FORNOVO GAS compressor 4SA200 37kW and a dispenser ERM New with one hose. Gas Networks Ireland already has two CNG refueling stations under construction, which will be also equipped by FORNOVO GAS packager with special compressor 4DA300 132kW with Oil free cylinders. European Commission’s grant will also help support the construction of a renewable gas injection point, and provide support to commercial vehicle owners wishing to purchase dedicated NGVs, ensuring that renewable gas will become part of Ireland’s transport fuel mix.